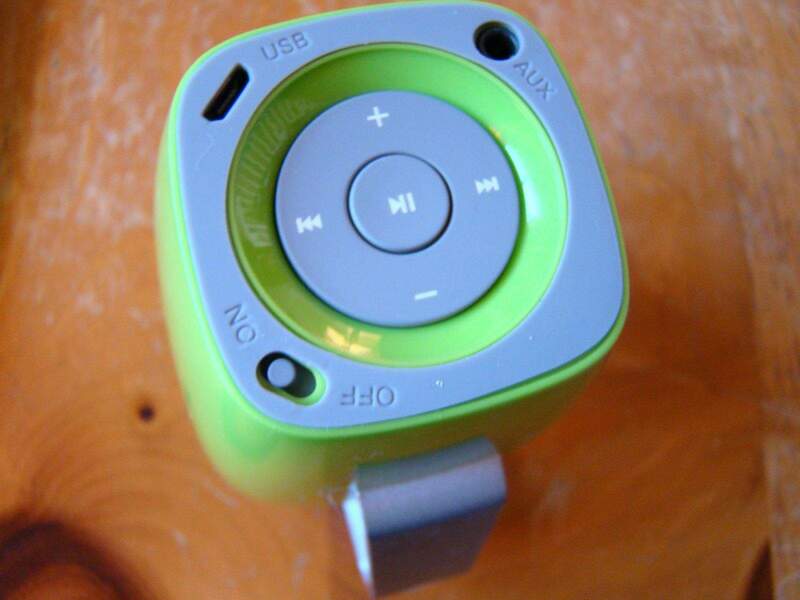 Tiny portable bluetooth speakers are all the rage these days, and we’ve seen our fair share of them. Trouble is, the smaller the speaker, the worse it sounds. Honestly, if your bluetooth speaker sounds worse than the built-in speakers on your iPhone, you’ll likely not want to go through the trouble of even pairing the thing up. 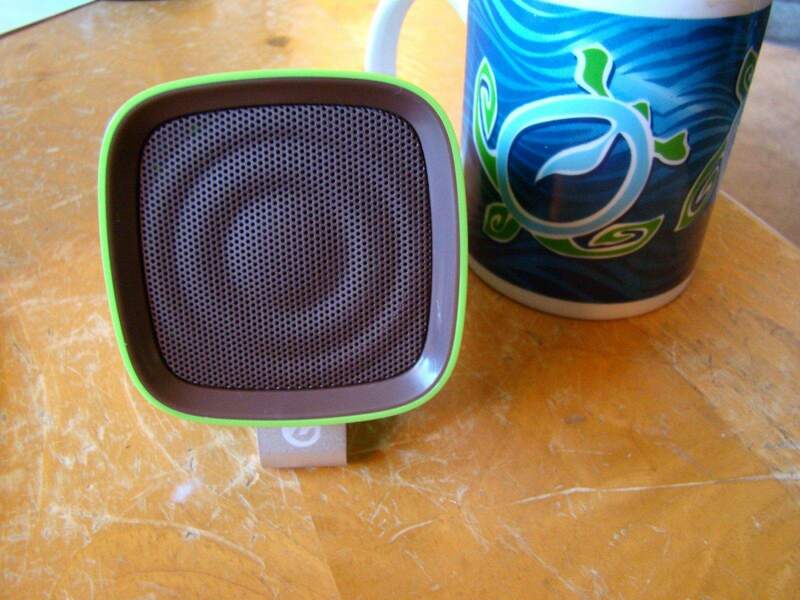 The Music Cup bluetooth speaker is small, shaped like a mug, and it sounds pretty darn good. 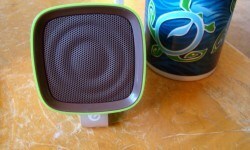 When I opened up the packaging, I was instantly attracted to the Music Cup on looks alone. “Boy I hope this doesn’t sound crappy,” I thought. The almost ’70s green glossy finish on the outside of the cup is complemented nicely by the equally retro brown color on the speaker portion, perfectly mimicking a full cup of coffee. The handle is a nice silvery color, which just makes the whole speaker a nice bit of pop art to have on your desk, nightstand or counter top. The handle doubles as a prop stand, letting you direct the powerful speaker wherever you may be sitting. And that’s the beauty of this device–being able to point the speaker right at my head is a nice way to make sure I get the full spectrum of sound output by the Music Cup. And it’s a solid spectrum, at that. Sure, it’s not audiophile quality, but the sound emanating from the Music Cup is crystal clear, and the volume tops out at a nice, non-distorting decibel level. The bass response here is pretty darn great, considering the size of the speaker. I’m sure it helps having a nice big resonating cavity behind the speaker proper. 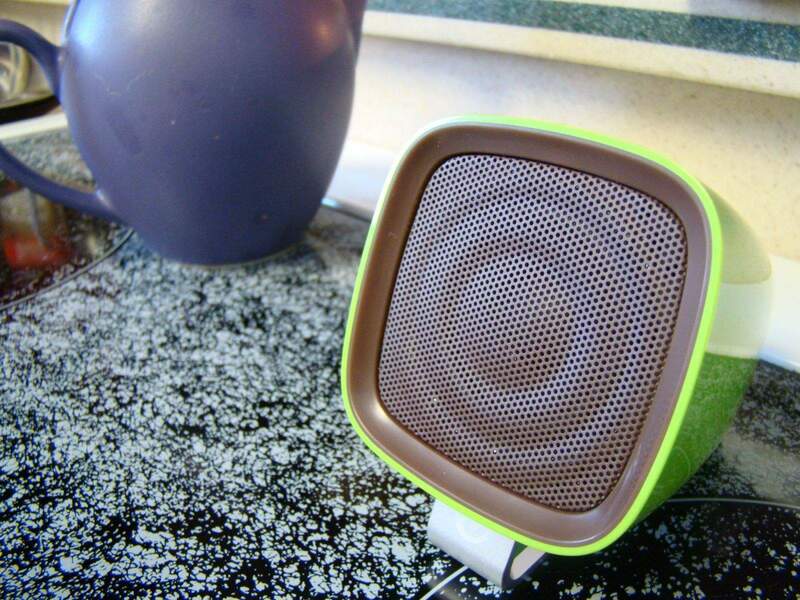 Ultimately the sound is well-balanced, letting you enjoy a wide range of musical styles and genres. The bottom of the Music Cup is where the controls are, with a Volume Up, Volume Down, Skip Forward and Back button which will control your iPhone while you use it. There’s an added NFC feature to make tap-pairing a reality, but that feature isn’t on iOS devices, yet. The Bluetooth 3.0 standard ensures a decent range of up to 33 feet, and will keep the Music Cup full of tunes for up to six hours. I was able to routinely get that many hours out of it on a full charge, which only takes about three hours. The Music Cup charges via a micro USB port on the bottom of the cup, which has an On/Off switch and a direct analog port to plug in any sound source with a headphone jack, like that old Walkman you absolutely refuse to give up, as it’s the only way you can play those cassette tapes, anyway. The pairing process was absurdly easy–I turned on the Music Cup, went to my iPhone, and found it in the Bluetooth settings. Same process on my Mac: super easy, no buttons to hold down or LED lights to mis-interpret. This thing is crazy simple to use. I’m not sure I’d use this as a travel speaker, as the size and shape is just odd enough to not easily fit in a minimalist travel bag like mine, but I’d totally grab it for a quick meeting where I needed a better sound output than my iPhone. If I had a larger bag at my disposal, I’d love to have this at a hotel to keep my tunes louder and better sounding than just my iPhone, for sure. Around the house, though, this is a winner. The Music Cup is delightful to look at, sits up like a mug, or on its handle like a megaphone, and just keeps out of the way no matter where I put it. 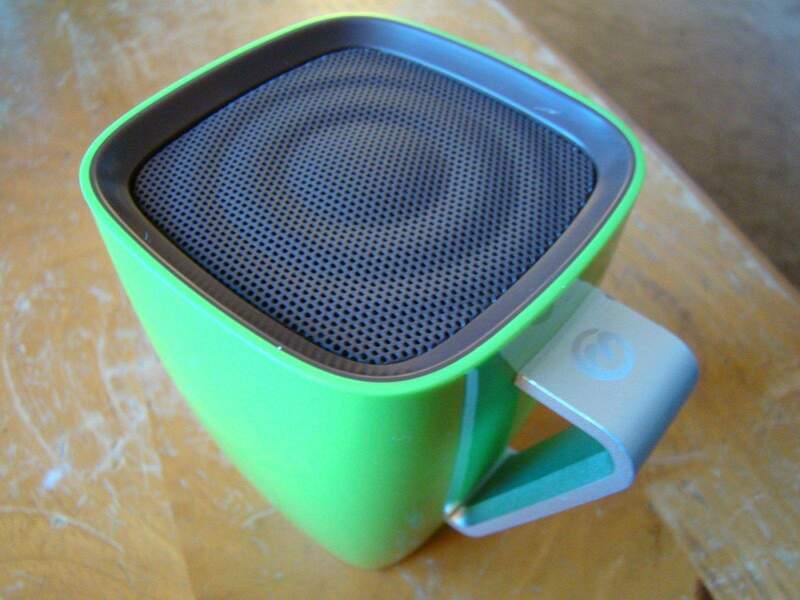 On the kitchen counter while cooking, on the coffee table while working, or on a shelf while folding laundry, the Music Cup is small enough to put anywhere, cute enough to look at, and loud enough to be heard over any kitchen noise. The Music Cup doesn’t double as a hands-free telephony device, and I’m perfectly happy with that. I never use that feature with other speakers, anyway. 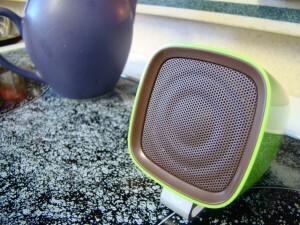 So far, it’s been a brilliant little speaker that I’ve used around the house for days with nary a worry. In the final count, then, isn’t that exactly what you want? For $40, I heartily recommend this delightful little speaker. 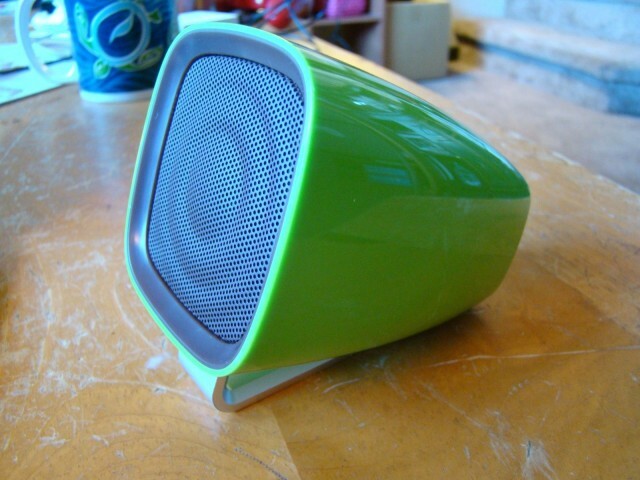 The Good: Sounds great for such a small speaker; great price and cool retro look. The Bad: No speaker-phone ability. The Verdict I’ve used this little beast more often than I figured I would, toting it around the house with me to keep the music going; well worth the $40.